I've noticed a lot of people coming into the nursery lately with questions about citrus. Why is their tree yellowing, why is the fruit splitting, why doesn't it look healthy? Many of these problems can be corrected by changing a few simple things. Let me get to fruit drop and fruit split, first of all. At this time of year, some dropping fruit is natural. Same with the peel splitting, because extreme changes in temperature can cause both these things to happen. Unfortunately, there's not much you can do about it. This year has been especially bad for fruit splitting, because the weather has gone hot, cool, hot, cool. If your tree is dropping more than 50% of your unripe fruit, it may also have to do with your watering. If the tree is being over-watered or drying out too much, it can cause fruit drop. Follow the watering instructions I will give later in this blog entry, and it should clear the problem up over time. 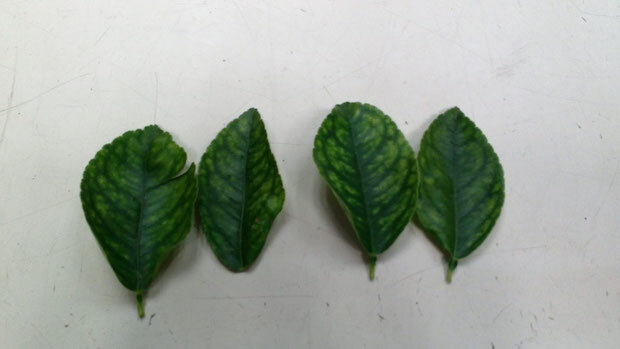 You may notice your citrus leaves yellowing, or darker veins showing on the leaves (as pictured). Yellowing can be a sign of over-watering, and also lack of nutrients. Often, you get yellowing and visible veins here because of how our soil is. Citrus trees grow best in soil with an acid pH, and our pH is typically very alkaline because we don't get a lot of rainfall. The thing is, when the soil pH is too high, your citrus tree can't properly absorb nutrients. 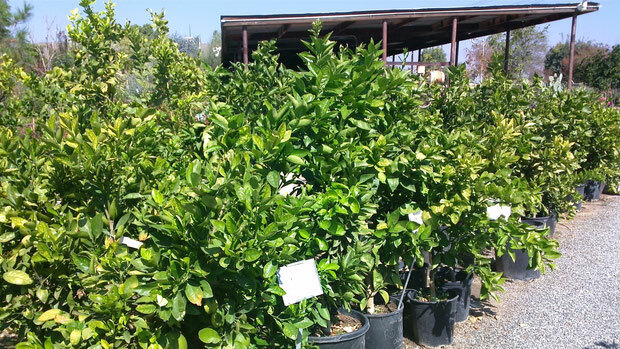 The combination of alkalinity and clay soil (which much of our valley has), means many of our citrus trees end up over-watered and lacking nutrients. The good news is this problem can be corrected! To adjust your pH, the best place to start is by adding gypsum to your soil. On citrus, you want to put your gypsum on 3 times per year (spring, summer, fall). Gypsum does 3 good things- lowers your pH making it more acid, breaks up clay in the soil increasing drainage, and leaches out minerals that can build up in the soil from hard water. Another thing that can really help your citrus look healthy and produce tons of tasty fruit is fertilizing regularly. An easy way to remember when to fertilize your citrus trees- St. Patrick's Day, Memorial Day, Labor Day. 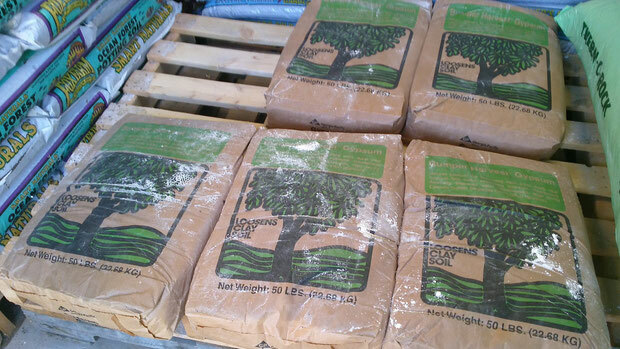 These are the three times per year that you should be feeding your trees. You don't want to feed later than September, because it will encourage new growth going into cold seasons, and new growth is more easily damaged by cold. 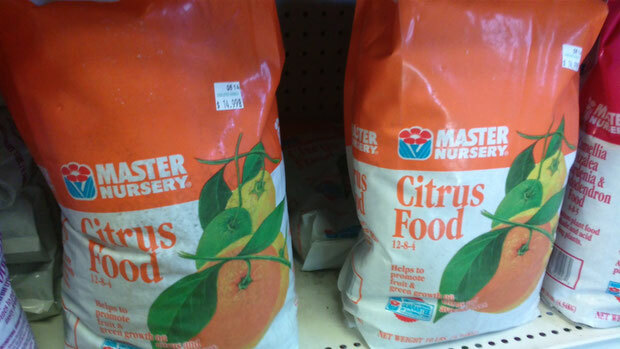 I recommend Master Nursery Citrus Food, which we carry here at the nursery. Another thing to remember- always apply your fertilizer where your water goes, because this is how it can be absorbed by the tree. Now, let's get into watering. How often you water your citrus tree is going to depend largely on how old the tree is and what time of year it is. The older the tree, the less frequently you will water it. For young citrus trees (under 5 years old), water them twice per week in the summer, once a week spring and fall, (adjust accordingly for our fall days that are over 100 degrees), and in the winter, don't water much except during extreme dry spells. Another key to watering correctly is running your water for the correct amount of time. It's hard for me to tell you exactly how long to run your water, because this depends on what type of drippers or watering system you have. For young trees, try to give them approximately 5 gallons of water each time you water them. What you need to happen is for the entire root zone to be watered through, so you need to give enough water that it goes several feet down into the ground. Drip systems are best for this, because they deliver the water slowly so it can soak deeper and there is less run-off and evaporation. You will want to run a drip system for at least a half hour each time you water. If you have older, established citrus trees, you need to give them more water at a time (up to 10 gallons), but do it less frequently. During summer, once every one to two weeks depending on your soil because some soils drain faster than others. The rest of the year, once or twice per month, depending on weather. On an older tree, another important factor is watering in the right place. You don't want to water your tree right at the trunk. Look at where the branches go out to, then draw an invisible line from that point to the ground. This is where you want to deliver your water and nutrients (fertilizer) to your tree. This is where the newer roots that can uptake water and nutrients are located. It's a good idea on a larger tree to put a deep drip stake into the ground, that way you can run a hose right into it and it delivers the water deeper into the soil. I would recommend that you also have a spot you can water your tree on the surface, so you can apply your fertilizers and gypsum to be absorbed. Just a few things to note about pruning citrus, especially your dwarf or semi-dwarf citrus. Do not prune them hard. On a dwarf citrus, it can take a couple of years to fruit again if you prune them really hard. Prune them for shaping only, and do it at the end of spring. June is a good month to prune your citrus, because they have already bloomed and your fruit is setting, so you can avoid cutting off a lot of your harvest. Something to watch for- always look for sucker branches growing out low on the tree, below the graft. 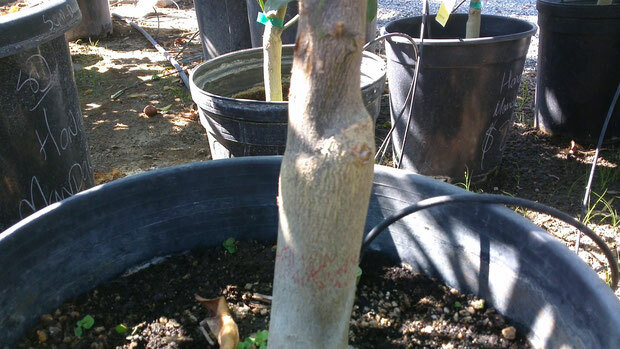 (The graft is a bump low on the trunk, as pictured. Most citrus trees are grafted). 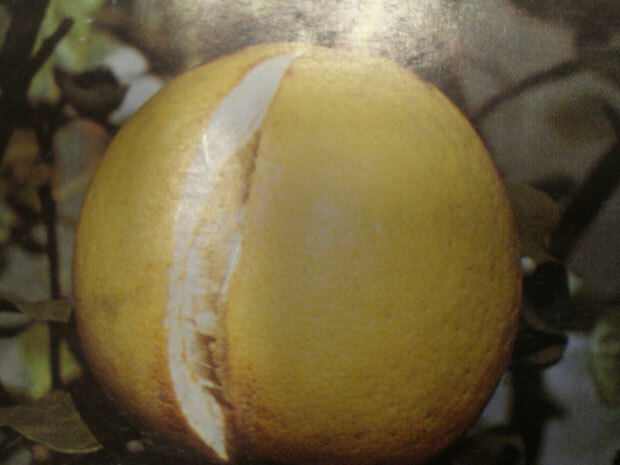 Remove any of these sucker branches immediately, as most citrus are grafted onto inedible sour orange root stock, and it's very aggressive and can take over your tree. Winter is coming up soon, and if you have young citrus trees, you will want to keep a close eye on the weather. We can get freezing temperatures at night in our valley, sometimes for a week straight, and this can severely damage certain varieties of citrus, especially when they are small. Be very careful if you have limes or any variety of lemon except Meyer. These are the most tender of the citrus. Mandarin oranges, Meyer lemons, and kumquats are the most cold hardy, and you don't usually need to worry about them. Oranges and grapefruits won't be damaged as much as limes, but I would still recommend covering them during freezing nights, especially if we're getting several nights of frost in a row. Freezing is 32 degrees Fahrenheit, and I would recommend covering your citrus if the temperatures are going to drop below 32 degrees. A note about covering your trees- never use plastic. It doesn't breathe, and it can actually burn your plant if the plastic is touching the leaves. You can use any cloth material, such as old towels or sheets, but will probably need several layers, and remember to take them off during the day. Burlap can also be used. 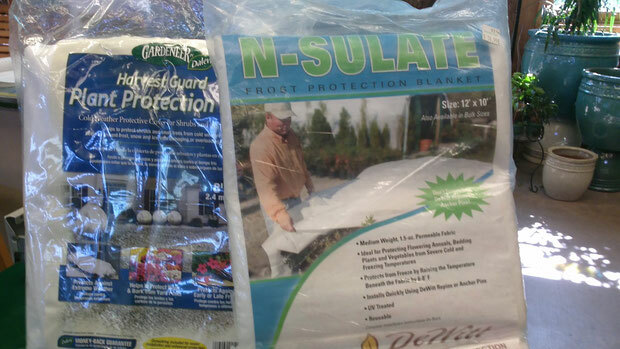 The ultimate in protection, though, is the frost blanket (as pictured). These can actually raise the temperature between 6 and 8 degrees warmer than the outside air, so they really do give the best protection. They are made out of a special material that allows air circulation, so they can actually be left on during the day.